I’m pleased to announce the first stable release of kte-collaborative, which provides collaborative text editing in kate through kde-telepathy, and an update to the libqinfinity library. kte-collaborative 0.2 depends on kde-telepathy 0.7 beta or later, and works with libinfinity 0.5.x. 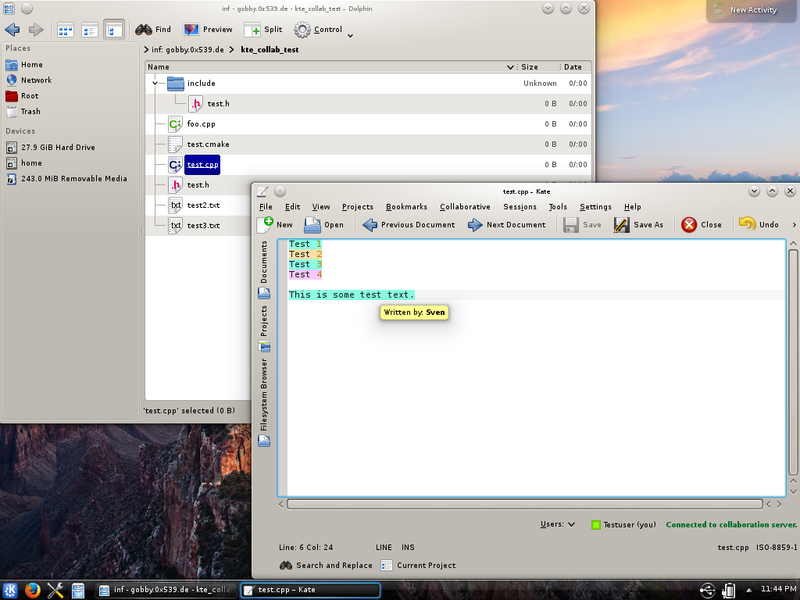 kte-collaborative 0.2, with dolphin listing some files from gobby.0x539.de and editing a file in kate. There have not been many noteworthy user-visible changes since the last beta release, so please to refer to the 0.2 beta announcement for more information. As always, please report any bugs you find to bugs.kde.org! It would be such a good thing to be able to do the same with document editors like Calliga Words… Do you think this software of you will be capable of collaboratively edit ODT documents? No. What I wrote is strictly plain-text, and intentionally so in order to make it useful for the programming context (code review etc.). The underlying library I use could be used to do this for ODT files, but it's not implemented. Projects which do this for ODT do exist, by the way. I don't know how complete they are but from time to time demos are popping up. Ah, I didn't know there were such projects. I'll search for more info.